The structure and reinforced pad were first constructed to support the preparation of the Hwasong-15 TEL used in the 2017 test. Located 29 km northeast of Pyongyang, in the city of Pyongsong, the March 16 Factory was established on March 16, 1977 to produce heavy trucks for both civilian and military use. 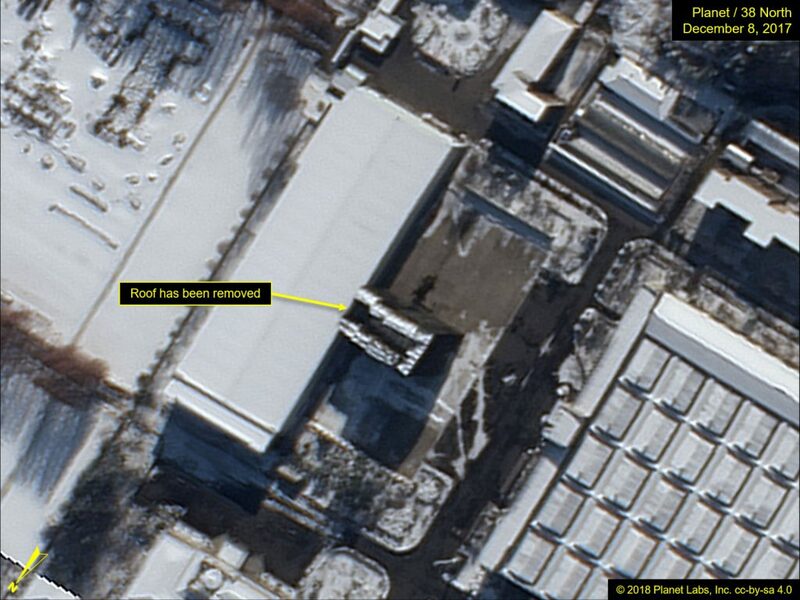 While long suspected of supporting the North’s ballistic missile program, it was only during late 2017 that this was confirmed by open source satellite and ground imagery. During mid-October 2017, the arrival of equipment and material for the construction of what would soon be a uniquely configured temporary shelter on the west side of the factory’s final check-out building was first observed. 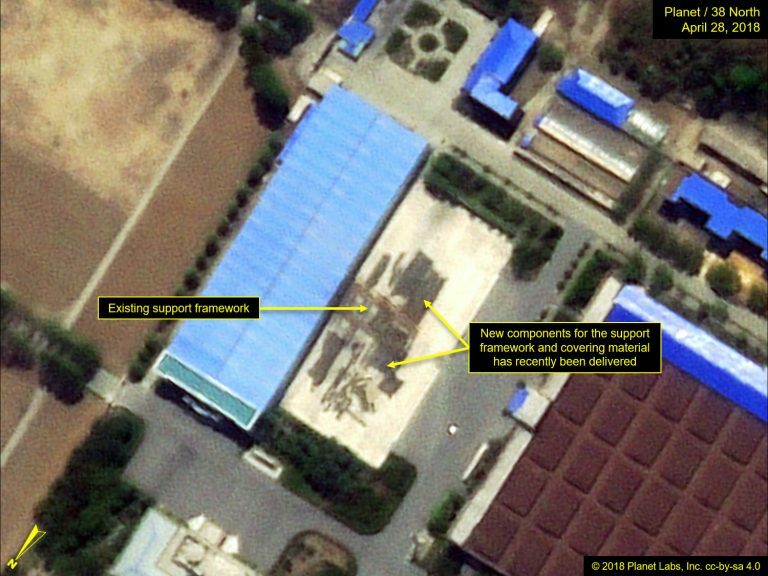 Subsequently, it was revealed that the building and temporary shelter were used to modify the Hwasong-15 TEL and test the operation of its elevation cradle and detachable launch table for the November 28, 2017 test launch. Figure 1. 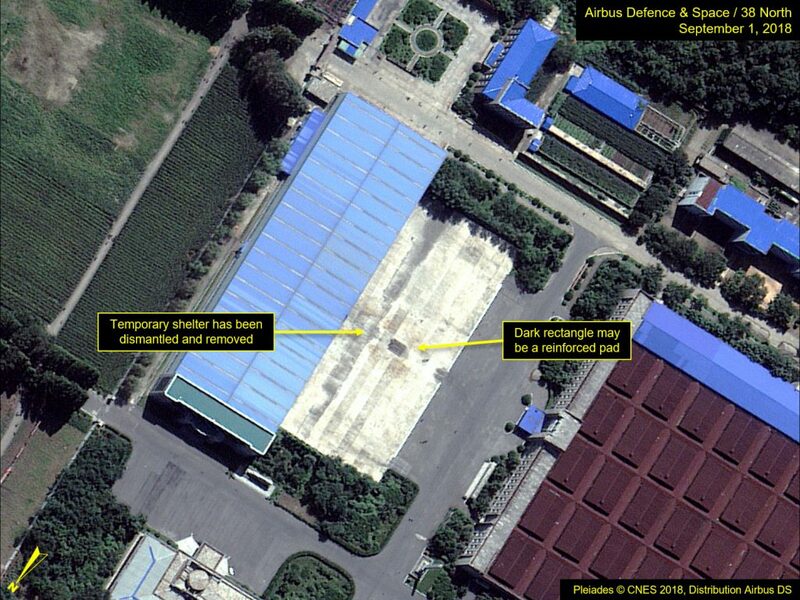 Building and temporary shelter that were used to modify and test components of the Hwasong-15 TEL. 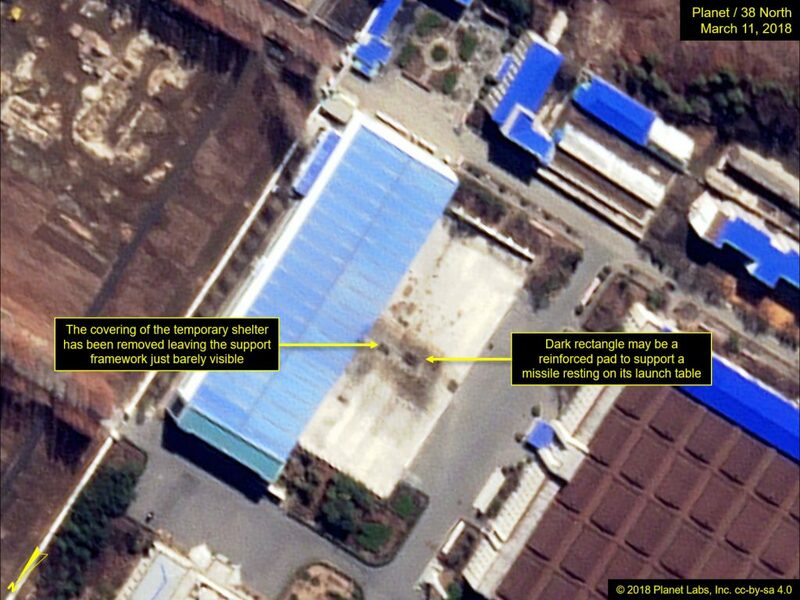 Following the Hwasong-15 test launch, the shelter remained essentially untouched until early 2018 when imagery from March 11 shows that the shelter’s covering was removed and the structural framework was being modified. Figure 2. Major modifications to the shelter occurred between December 2017 and March 2018. Imagery from April 28 shows that the framework was apparently being rebuilt. By June 30, the newly modified framework was once again covered with what appears to be canvas tarps. Figure 3. Reconstruction of the shelter’s framework occurred between April and June 2018. Imagery from August 8 showed that the covering of the shelter had once again been removed and preparations for the complete dismantlement of the shelter had started. By September 1, the shelter and framework had been removed, but the reinforced pad is still clearly visible. Figure 4. Dismantlement of the shelter took place between August and September. Update: The title and text of the article were corrected on September 12, 2018. 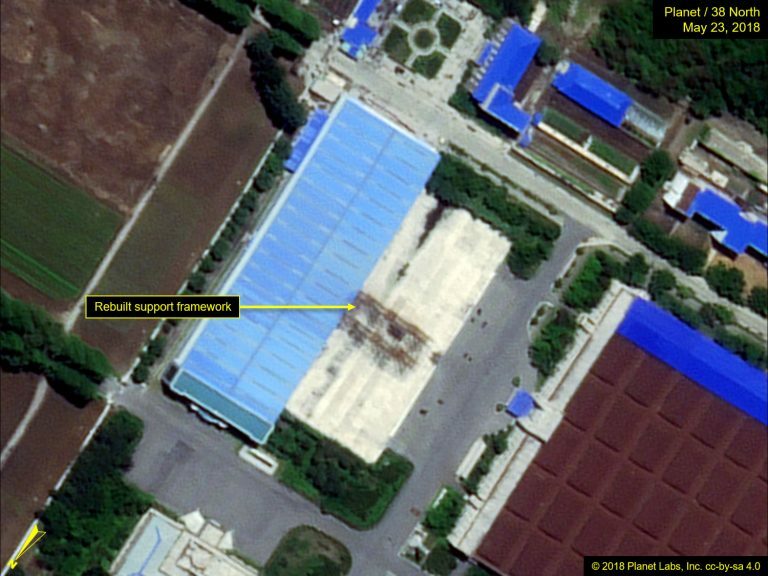 It is likely that the March 16 Factory has been associated with the ballistic missile program for many years, however, the November 28, 2017 event provided the first readily available open source proof from ground and satellite imagery of its involvement. 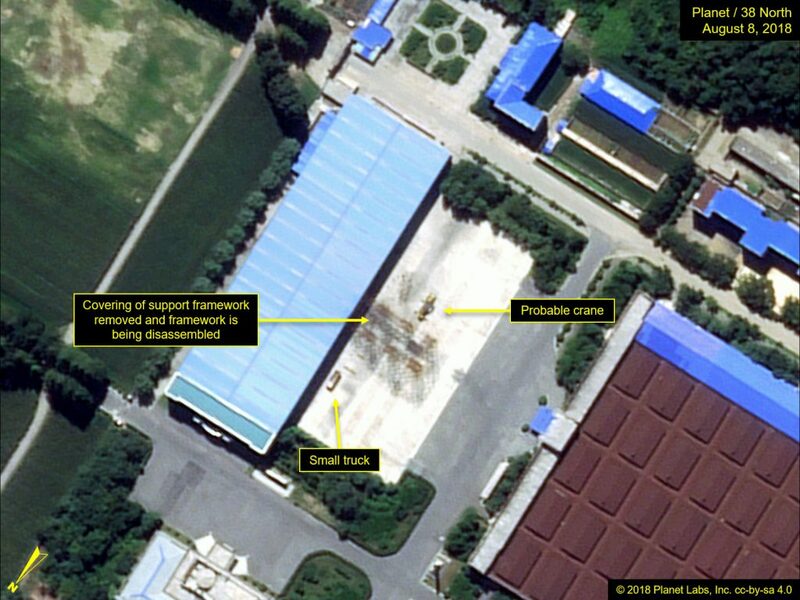 The Kal-gol Missile Operating Base is one of several missile bases in the southern third of North Korea that houses what is believed to be a Scud or Scud-ER missile brigade. The No. 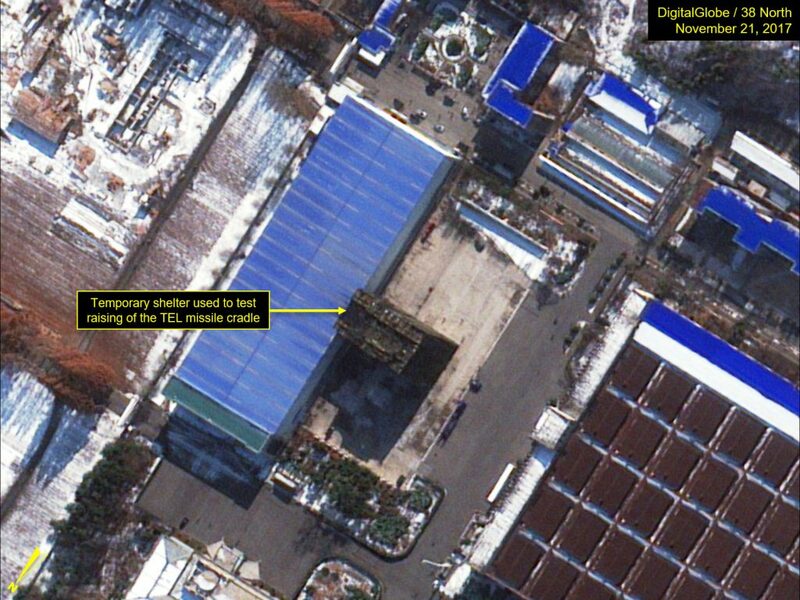 65 Factory is one of North Korea’s oldest and largest munitions manufacturing facilities and where it has previously modified imported WS51200 chassis into TELs. “Kim Jong Un Inspects March 16 Factory,” Rodong Sinmun, November 4, 2017; and “N.K. Leader Inspects Truck Factory, Calls for Modernizing Automotive Industry,” Yonhap, November 4, 2017, http://english.yonhapnews.co.kr/news/2017/11/04/0200000000AEN20171104000800315.html. Ibid; and “North’s Missiles Use Russian Trucks,” JoongAng Daily, April 22, 2017, http://koreajoongangdaily.joins.com/news/article/article.aspx?aid=3032544; author interview data; and satellite imagery predating and postdating the Hwasong-15 launch. 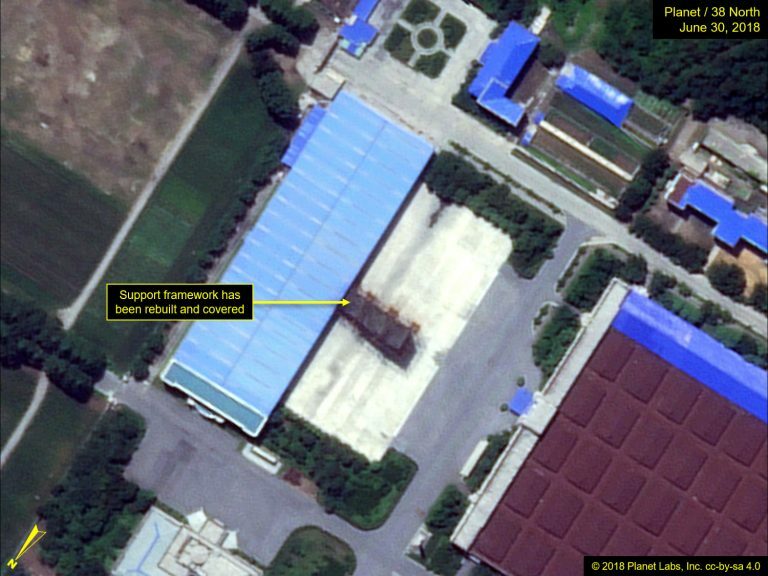 It is likely that it was here, at the March 16 Factory, that the Hwasong-15 TEL chassis was modified to carry and launch the Hwasong-15.